The name Wander Franco litters the Appalachian League's leaderboard in a host of categories. 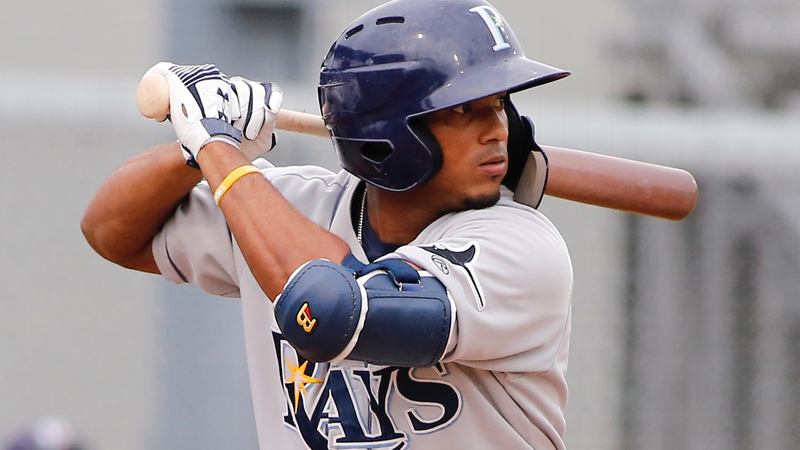 With the Minor League season entering its final stretch, he's bidding for a batting title. Baseball's No. 40 overall prospect continued his blistering August with three more hits -- including a go-ahead home run -- bumping his average for the month to .408 through 19 games as Rookie-level Princeton held off Bluefield, 8-7. "I'm not sure it's [just] a crazy August," Princeton manager Danny Sheaffer said. "I think he's doing everything from the beginning of the season until now that's pretty spectacular. Yeah, he's 17. We all get that, but he does things defensively and offensively that you're not supposed to be able to do at his age. It's exciting to watch him play." Franco was retired for the only time Monday night in his first trip to the plate, grounding out to third base to end the first inning. From there, the shortstop took off, opening the fourth with a single to left field, adding a single to center in front of Carlos Vargas' two-run homer to left in the sixth. In the bottom of the eighth, he belted the difference-maker, a solo blast to center. "He got ahead, 3-0," Sheaffer explained. "He took a strike, and then he swung at a pitch on a 3-1 count that he more or less just kind of slapped at to put it in play. In my mind, and I might have verbally said it, that's not a very good 3-1 hack. "I wouldn't have thrown him a strike no matter what, and [Sean Rackoski] threw him a fastball he hit 400 feet. He's a big stage player at 17 years old, and it'll be fun to watch him progress because he's going to be a pretty good big leaguer someday." The three-hit performance was the fourth of the month for Franco, who has posted a.494 on-base percentage and a .698 slugging percentage for August. For the 14th time this season, the 17-year-old -- who has most often been Princeton's second hitter in the lineup -- batted cleanup. Out of the four-spot, Franco is a .451/.548/.745 hitter with three of his 10 home runs and eight of his 53 RBIs. "I really don't think it matters where he's at," Sheaffer said. "When we lost Jordan Qsar (after his promotion to Hudson Valley), we dropped Wander down to the four-spot. He answered the bell big time. It's really hard to explain, but he really likes the position that puts him in a position to be the leader on the club, the offensive leader. He's not intimidated by any number in the lineup, whether he's second, third or fourth. It's hard to explain unless you watch him every day, but he has some really special tools. "I've managed a lot of great players, and I've played with a lot of great players. He doesn't seem like a 17-year-old kid at this level. He seems like a grown man playing a kids' game. I know his background. I know his bloodlines and all that kind of stuff, but there are times that you look at Wander and say, 'There is no way that he is that age and playing at this level.' But then he does some things that say, yes, he's a 17-year-old. He does make some mistakes, believe it or not, but he separates himself from just about every other player in this league. I think that's going to be the case for years to come." Tampa Bay's No. 4 prospect jumped within one point of the Appalachian League's top spot in the batting race with a .373 average after the victory. Cal Stevenson, who went 1-for-4 in Bluefield's loss Monday, leads the circuit at .374. Franco stands first in the Appy League in hits (78), RBIs (53) and total bases (131), second in extra-base hits (26), third in runs scored (43) and fourth in slugging percentage (.627). "There's no shutting it down for Wander. He's got a goal in mind, and whether he reaches that goal or not is really up to him because he's in competition for a batting title, for an MVP and all of that stuff. He sees the light at the end of the tunnel. He's got a goal in mind. A lot of time when you're managing in the Minor Leagues, you see guys with one foot on the highway. They're ready to go home, and I fully understand that, but I don't see that with Wander. "The only thing he really cares about is success and putting up numbers, and in the end, that's why we play this game."